From the largest wildlife spectacle on the planet and vast tracts of untamed wilderness, to colourful Maasai rituals and tranquil rhythms of Swahili towns and the idyllic beaches of Zanzibar and the islands on the Swahili Coast, Tanzania offers a unique glimpse into Africa as it has remained for centuries. Northeast Tanzania encompasses a volcanic region that includes Mount Meru (14,979ft/4,566m) and Mount Kilimanjaro (19,340 ft/5,895m), the latter being the highest point in Africa and the tallest free standing mountain in the world. To the west of these peaks is the legendary Serengeti National Park which for nine months of the year is home to the greatest concentration of migratory game animals in the world – some three million herbivores and the predators that hunt them. The Serengeti ecosystem also includes the famous Ngorongoro Crater, a 20-mile-wide volcanic crater which holds an extraordinary concentration and diversity of wildlife. Home to approximately 120 tribal groups, Tanzania has an incredible tribal diversity in addition to its varied landscapes and wildlife. Cultural tourism has become increasingly popular and visits to local villages are often a highlight of safari itineraries. The Maasai are the best known of Tanzania's tribes and inhabit the northern regions of the country. Our safaris cover the northern, southern and western circuits in Tanzania. In the north, we take you on magical journeys into the Serengeti, Ngorongoro Crater, Tarangire and Lake Manyara. In the south, we explore the wilder Selous and Ruaha game reserves and lastly the unique wilderness areas of Mahale and Katavi in the west. Apes are highly intelligent primates. There are 13 ape species including chimpanzees, gorillas, gibbons, and orangutans. Apes are sometimes confused with monkeys, but unlike their smaller primate cousins, apes do not have tails and their arms are usually longer than their legs. Apes are only found in the tropical woodlands and forests of Africa and Asia. Few luxuries compare to a safari led by an experienced private guide and vehicle, through Tanzania's highlight regions of Ngorongoro and the Serengeti National Park. 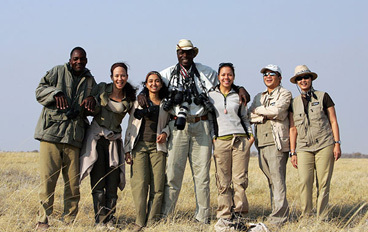 Dictate your own pace, observe exciting sightings and enjoy in-depth discussions on this big game safari. Indulge on an exquisite luxury Tanzanian safari to three areas synonymous as being the best wildlife areas to visit on the African continent. Defined seasons drive East Africa's migration of wildebeest and zebra and many camps follow, thus staying with the herds. This privately guided summer safari visits Tarangire, Ngorongoro Crater and the Serengeti, combining Maasai culture, wildlife sightings and jaw-dropping scenery.